The cloak of empty experience is an interactive installation that is hung from the ceiling. 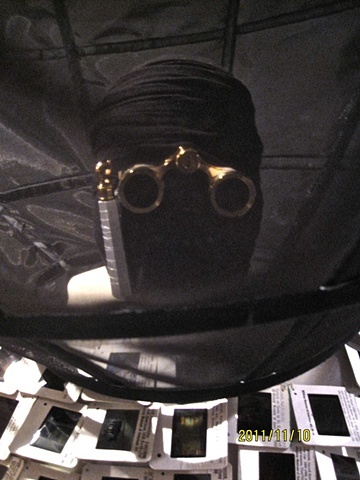 When displayed, the view is able to step inside the cloak, put on the mask with the opera glasses attached, stick their head in the satellite dish, and look up on the ceiling where another mini satellite dish will be. Through the mini dish there will be 1 slide that the viewer can find.